About 9 years ago I lived a lifestyle centered around the beach & kitesurfing in SoCal. At the time I owned a 2005 Tacoma with a basic Leer canopy. I built out a small bed frame to support a Japanese fold out bed so I could maximize gear storage and hold my surf boards, but it always felt cramped. I dreamed of something bigger with more headroom and features to accommodate coastal travel for days on end. I discovered slide in campers but the cost, even for a used one with questionable leaks, for a tacoma was too expensive for me to consider. Aside from cost a slide in solution left me with the problem of day-to-day city use practicality, I didn’t camp everyday. There are larger cabover utility-like fiberglass solutions but those can run 5 - 10k empty and factoring in build cost led me to eliminate that solution. Moving to Oregon, my lifestyle quickly evolved to being centered around camping and exploring Oregon’s back country. During that time me and my wife spent 2 weeks in the south island of New Zealand in a small custom camper driving the backcountry. The camper was rad, it had exactly what you need with some inconvenience so it forced you to be resourceful. When I returned I decided I needed a new truck shell solution and what I wanted in fit, finish and functionality did not exist. Like so many people I didn’t have 10k sitting around to brief a local company to build my dream truck shell so I decided I it would take on the build. The first phase to the build was ideating for almost 2 years drawing in a sketch book and making notes each time I went camping through all 4 seasons. I took this time to start obsessing my key needs to be adaptable to Oregon's various climates. I wrapped this process up and I wrote myself a mini brief which outlined what I needed most out of the truck shell design and used it as my Northern Star when I had to make critical decisions on functionality and cost. Key criteria I obsessed was: exterior design looks, lightweight, and modularity. I wanted a camper aerodynamic in design but with a balanced look that would sync with the design lines of the truck. I love the look of the Tacoma and I wanted the camper shell to compliment it as much as possible. For the camper shell's weight I didn’t set a hard target, I just challenged myself relentlessly to question the build approach. A lot time was spent problem solving phases into the build thinking through all the possible solutions that were cost effective, simple, and reduced weight while maximizing strength and interior space. Oregon weather can deliver just about anything on a camp trip depending on elevation and location so being adaptable is key to having a great trip -especially if the weather shifts unexpectedly. This was a driving factor in a higher clearance shell design for the option not to pop the top. 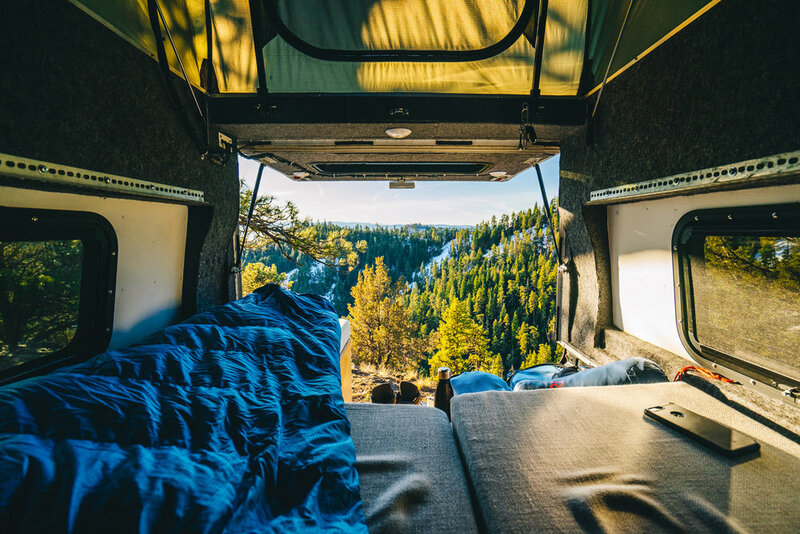 As much as a camper gives you a nice little dwelling to sleep in and feel comfortable from the elements I wanted to bring the outdoor experience as much as possible into the camper shell. Feeling connected to nature and the views was an important consideration that led the tent design having with three windows, the shell having three windows and one in the roof to view the Milky Way while falling asleep. 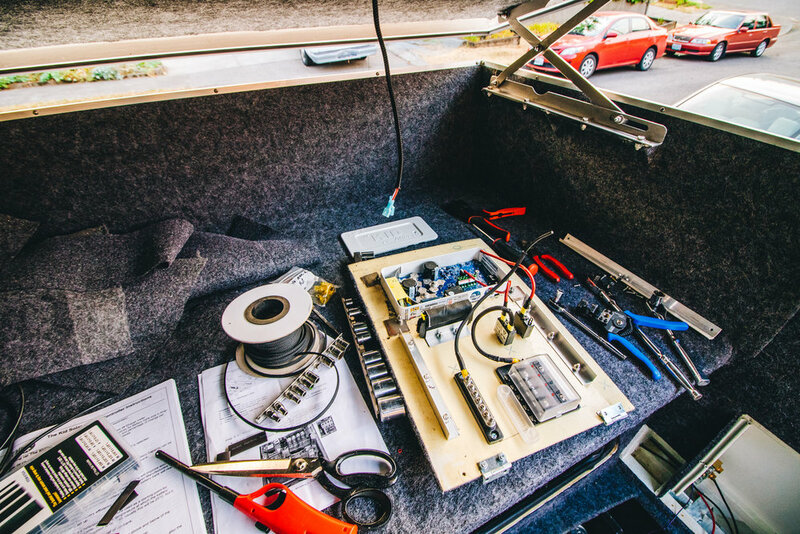 In 2016 I locked in a camper shell design that I believed I realistically could build which led me to pick a lane on material choice, construction method, and kicked off relentless searching on the internet for components and supplies. I decided on a pop top cab-over design to maximize space with a collapsable upper bed and a removable storage system for city needs. My original aspiration was to integrate aluminum as much as possible but the cost and space for proper tooling led me to take a different route to best achieve the particular look I was after. I was motivated by a Slingsby T13 Petrel glider that I saw at an annual aircraft fly in Hood River that proved that this approach could work. I determined I could achieve the complex curves of the design and create a strong yet fairly light weight structure through a composite approach integrating fiberglass, high quality plywood, and some foam. 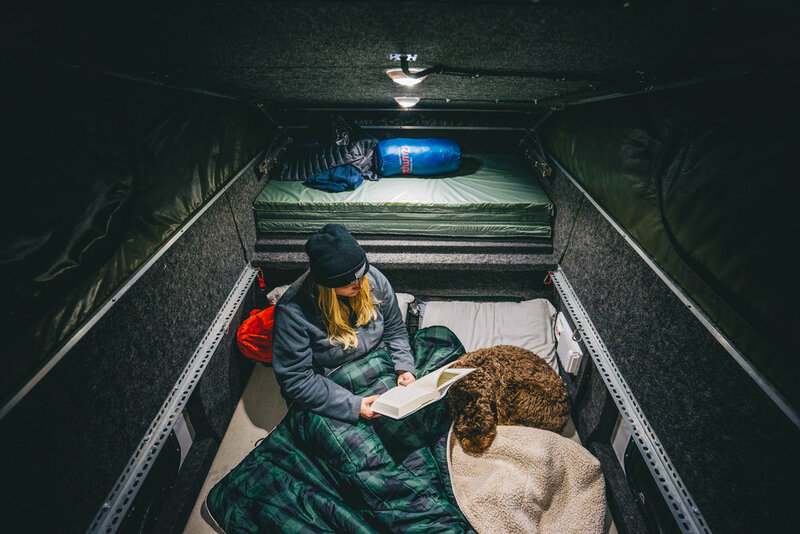 I also considered my camp missions and I believed this approach would enable me to go new places and see new things without overly penalizing the truck to keep it as capable as possible. With material choice locked in I shifted into a mock up phase. Before cutting any material I converted my sketches to cardboard parts to run some mock trials to save costly mistakes and it helped me adjust my build approach. This helped me create a basic templating system to start building the main structure to support the interior and exterior skin that would give the camper its shape and aerodynamic look. I sealed the frame with paint and packed the entire structure, roof, and rear door with as much insulation as possible. This led to wood skinning the interior, exterior, and then I fiberglassed from the outside to interior sealing off the inside of the structure and insulation. I then sorted all the mechanical aspects of the roof and rear door crafting custom brackets to mount the gas struts as well as the scissor hinge for the roof. With the main camper built, I focused on exterior paint and used a 2 part epoxy marine paint that does wonders in mimicking the result of HVLP spray gun. The interior was painted and then dressed with automotive interior fabric. From here I fitted a 30 amp MPPT solar controller to run 10 circuits with USB charging and toggle switches integrated at the rear door to operate 7 different lights. 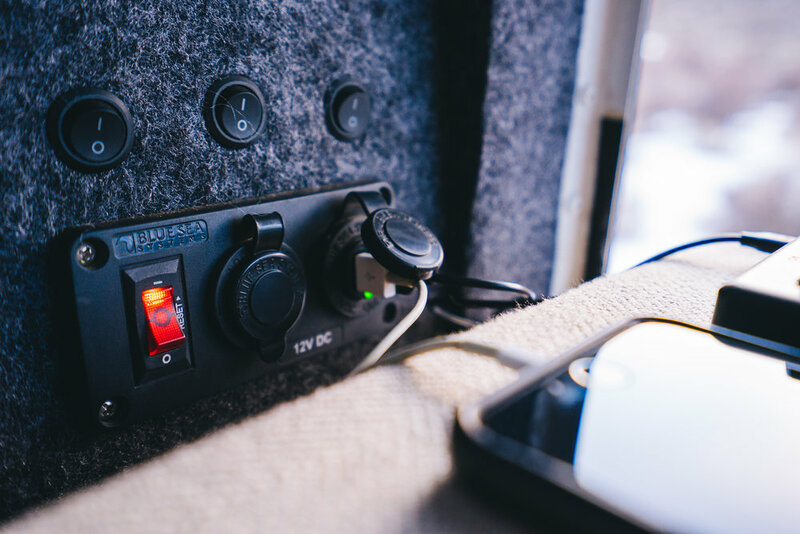 I designed the electrical system to be accessible to add or remove wiring to anticipate at the addition of a fridge freezer and other lighting as needed. From this point I worked through the tent design and sourced all the materials from a PNW vendor and bought a sewing machine. 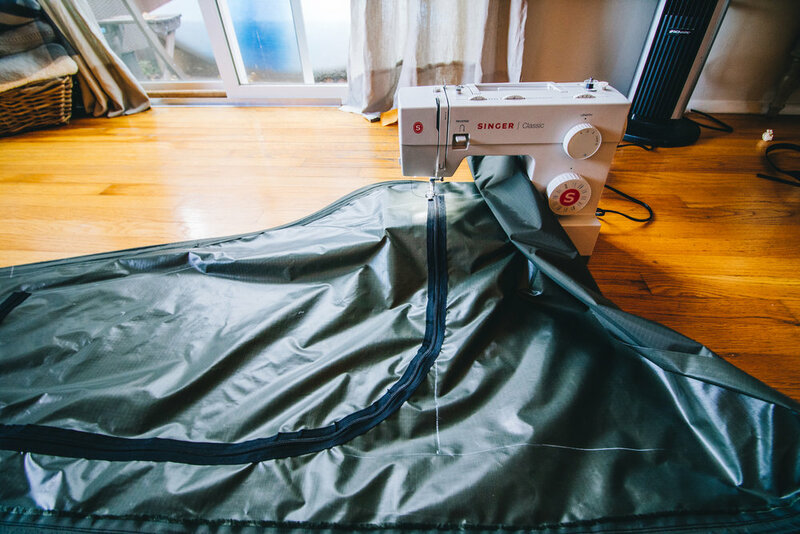 I taught myself to sew and in a few weeks I had the tent built and installed it. 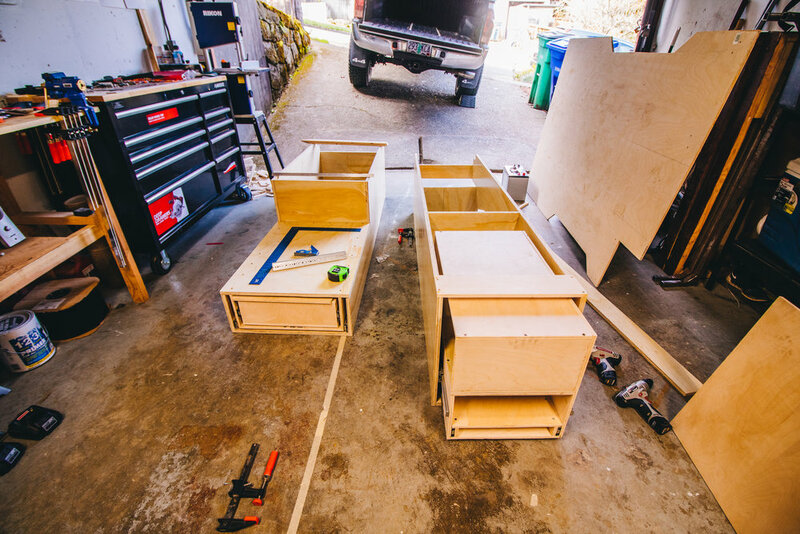 I wrapped up the build with the drawer system and cushion build out for seating and storage. I measured all my pots, pans, equipment and landed a design that created bench seating which converts to a day bed and drawer slides to create a modular cook space, storage for necessities, and to hold the cooler. As I wrapped up this phase I timed it with updating the truck's suspension with an Icon Stage 5 lift, RXT leaf pack and I'm running 33” Falken Wildpeak AT3W’s. The entire process went on and off for 19 months and approximate cost was in the neighborhood of 4k, minus tool investments. I estimate the truck shell weighs somewhere in the 400-450lbs range -still to be confirmed. A lot of time was lost due to work & personal travel, researching the internet to find what you can’t think of, analysis paralysis of what to buy debating between multiple options and endless Youtube videos to research and learn new things to get through a particular phase of the build. Overall I'm really happy with how it turned out and despite my time the truck shell delivers against all my original needs. A large part of this build I took on with no prior experience. My work background is in aviation manufacturing/maintenance, and footwear product creation which helped me think through the build process while creating tools or jigs for assembly, basic understanding of fiberglass, electrical, and the sewing portions. Anyone who is eager enough can learn these things with the internet and I would recommend any DIY’er to research on any technical learning ahead of the build to get a sense of what you are getting into and seek out help through forums. It'll save you time and money in the long run. It’s been over a year of camping and driving with the shell and no major issues. We’ve logged approximately over 15k combined road and trail miles to date in all parts of Oregon, Washington, east through a large portion of Glacier National park, south through California’s redwoods, Yosemite, the Sierras, and PCH1 all the way from LA to PDX. We’ve camped through all seasons and just about every form of precipitation and high winds. Overall I love how everything turned out and there isn’t anything major I would change other then small little learnings acquired over a year of camping. I plan to redesign the drawer system to make it lighter and a bit more modular in function. - skylight lets a ton of light in for the day and confirm Milky Way viewing in bed from the good spots. - Sleeps 2 adults with no drawer system, sleeps 3-4 adults depending which drawer system installed & day bed inserts placed between slide ins. Here’s a quick video from Michael’s Youtube channel. You can find more on Michael’s Youtube channel. Or follow his progress via his Instagram account.